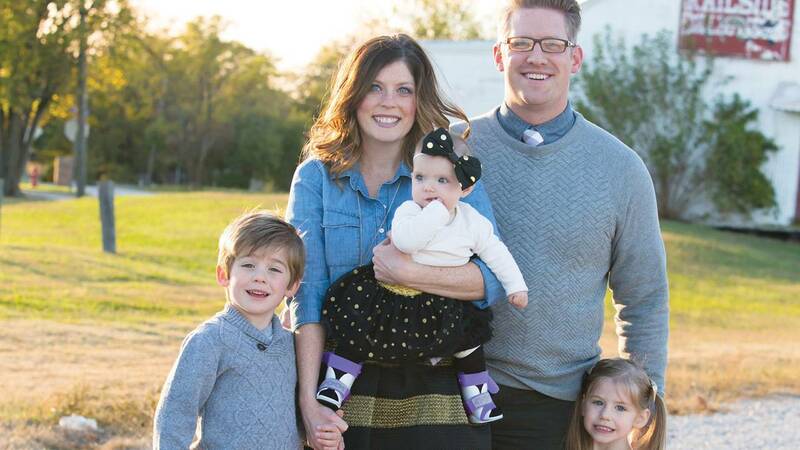 The moment Jordan and Matthew Cox of Broken Arrow discovered that their daughter, Poppy, now one, would be born with spina bifida, was devastating. The episode also served as a way to talk to their children, Gavin, then four, and Harper, two, about their little sister’s diagnosis. First, thank you for sharing your story. The touching letter you wrote the station detailing your story inspired us all. What was your first reaction as you were watching this episode of "Daniel Tiger's Neighborhood", airing the day after you learned of Poppy's diagnosis, and discovered it featured such a relevant story? My husband Matthew and I were so touched as we watched the episode. It was like it was airing specifically for us on that day. The day before we had learned of our daughter’s diagnosis and it was just so dark. The news of our baby’s condition was filled with medical jargon and statistics and faceless, impersonal information. When we watched the Daniel Tiger episode and we saw the two children playing together, laughing and having fun, it put a face on our situation; a smile, almost like a promise of happiness one day. It made us realize that while we had a long road ahead of us, we would be happy one day. Absolutely. We really felt so much hope and purpose in the timing of the show’s airing. It reassured us that this wasn’t a random mistake; that Poppy’s life would be filled with meaning and purpose. I know that thousands of people around the nation were watching "Daniel Tiger’s Neighborhood" that day, but it felt like it had aired just for us. We certainly felt like God used the programming to remind us that He hadn’t forgotten about us and had purpose in what we were going through. Describe your family's anticipation at adding a new member. We were all so excited! The kids were very excited to have a new brother or sister. We had initially decided to wait to find out the gender of the baby, so it was going to be this huge surprise. We had all of these to do lists for things we wanted to do to our home before the baby got here, time we wanted to spend with the older two kids one on one. We definitely had plans for how it was “supposed” to be. What were your emotions when you received the SB diagnosis? It was completely shocking. So many emotions go through your mind: shock, guilt, grief. None of the doctors could really paint a picture of what it all would look like... they can’t give you any guarantees, just statistical evidence. It felt like we were watching our whole lives unravel right in that doctor’s office. I still, to this day, have never Googled anything about spina bifida because I can’t let my mind go places “unguided”. I remember that the room we were in was very dark, all of the lights were off so that we could see the ultrasound. It was completely symbolic for how we felt; like we were just stepping into the dark, black hole of sadness. That’s all the more reason why the timing of the program the next day was so meaningful. It was a spark of light in the dark time and just felt like a promise that we would be happy again some day. How did this episode help you explain Poppy's condition to your kids? Before watching this episode, I am not sure that our kids would have had any exposure to someone who couldn’t walk or had to walk with assistance. The episode we watched showed an animated character named Chrissie that walks with braces and crutches. Her character gave us something to draw off of to explain that their sister might be born with some differences. The week after our diagnosis, we had to travel to two major cities to be evaluated to see if the baby and I were candidates for in-utero surgery. We were able to tell our kids that we needed to go visit some doctors that could help our baby’s legs. We talked about how as our baby got older, she might eventually need braces or crutches to walk or a wheel chair to move around. The episode gave them something to identify with and the concept of our baby’s legs not working the same as there’s didn’t seem so scary. In your letter, you mentioned the PBS documentary "Twice Born", about pre-natal surgery, also coinciding with a similar event in your life. What insights and knowledge did you gain from that program? Poppy and I were fortunate enough to be candidates for a procedure that allows doctors to perform surgery on the baby while still in-utero to close the opening in the spine. The goal is that this early intervention will reduce the effects of nerve damage related to the spine not closing fully. The surgery involves going through the mother, opening up the womb, closing up the baby’s back, and then requires 13 layers of closure to ensure that the baby is placed back safely and the mother can carry the baby for the remainder of the pregnancy. Once the surgery is performed, the mother has to be on bedrest for the remainder of the pregnancy to try to keep from going into preterm labor. In my case, I had to remain on bedrest in Nashville to be close to Vanderbilt Medical Center where my surgery was performed. I was separated from my family and friends for the remainder of my pregnancy. Again, the timing of the programming was uncanny when we found out that “Twice Born” which follows a maternal fetal team doing in utero procedures, would be airing while I was on bed rest. “Twice Born” provided us a tool to help communicate with our family and friends, not only about the mechanics, risk and complexity of the surgery, but the emotional and relational aspects of what we were going through. It was able to communicate things for us that we hadn’t even processed yet about what we were experiencing. It also helped to watch a couple who had walked a parallel path. Everything happened so fast for us between the diagnosis and the surgery that we had forgotten some of it. Watching the couple profiled in the documentary reminded us of certain meetings that we had with doctors during our evaluation and helped trigger memories of things that we might have otherwise forgotten about in all of our chaos. Overall, it was just an extremely meaningful source of education and validation. I had people message me after seeing “Twice Born” saying that they understood our journey more clearly. There was a line from the mother in the documentary where she stated that after making it through the surgery, pregnancy, delivery, etc.she felt like she had “gone to war”. That sentiment really resonated with me and not only articulated an emotion that I was experiencing at the time, but also helped our friends see the depth of what we had been through. 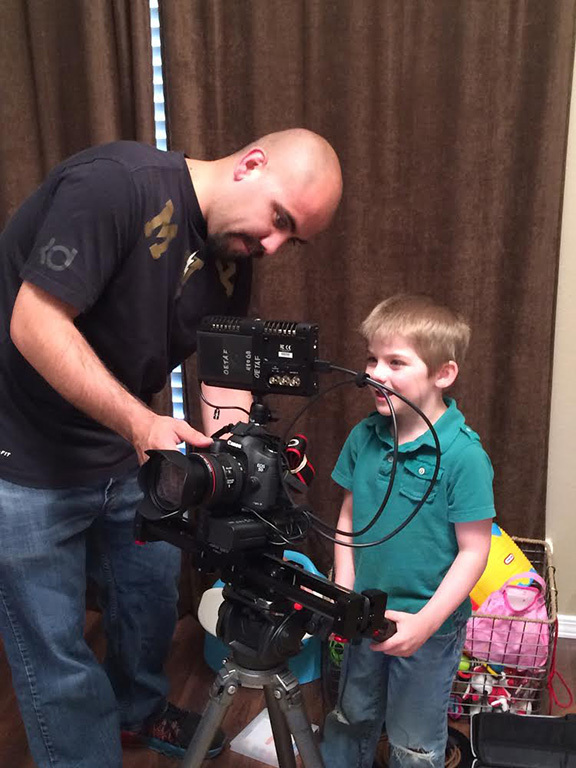 OETA Production Assistant Carlos Manzano shows Gavin Cox, 5, how to set up a camera shot. What other OETA programs do you enjoy? What about the kids? I LOVED "Downton Abbey" and watched all of the seasons up through Season Five while on bedrest. Also, my husband and I have enjoy watching concerts on OETA and made sure our kids were in bed on time so that we could have a “stay in date”. I know it’s dorky, but we’re parents! You have to get a date where you can! Another favorite, besides "Daniel Tiger’s Neighborhood", is "Super Why". I love that it is teaching my kids to spell. My daughter likes to pretend that she’s Princess Pea and writes letters with her magic wand. 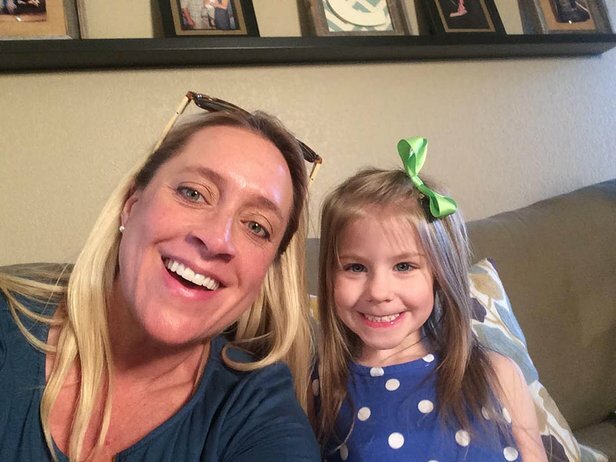 OETA Foundation's Melissa Stevener with "Word Girl" fan Harper Cox, 3. Do you feel like OETA's educational programming fills a gap in the TV world? Very much so. I trust PBS programming not only as entertainment, but as an educational tool and something that models good behavior. I trust that it’s helping my kids learn to think and process as they watch. "Daniel Tiger" exhibits calm and positive behavior, so I enjoy my kids observing those kinds of responses to the world around them. I feel like this is such a great resource for kids that may not have access to early childhood education opportunities or may not have parents that can spend as much time to teach them many of these lessons. It’s sad, but many kids live in situations like this, so why NOT have completely meaningful television to provide some of those opportunities. Poppy recently celebrated her first birthday. Congratulations on such a big milestone! What are some of the challenges and triumphs your family has experienced this year? Wow! We’ve had some high highs and low lows. One of the most exciting things was watching Poppy defy odds that we knew from day one would be a challenge for her. We were told in the NICU that Poppy might not ever be able to sit on her own. Poppy not only can sit on her own, but she can move from a laying position to a sitting position all on her own. That felt like a major victory! We also have been SO pleased to see her be able to move her legs. There is definitely nerve damage and she doesn’t move her feet, toes or ankles, but we never saw her legs move during 27 ultrasounds throughout my pregnancy, so to see them have coordinated movements now, even though they’re not fully functioning, is still a pretty huge gift. We named her Poppy and our last name is Cox, so her name is Poppy Cox. The term poppycock means “nonsense”. 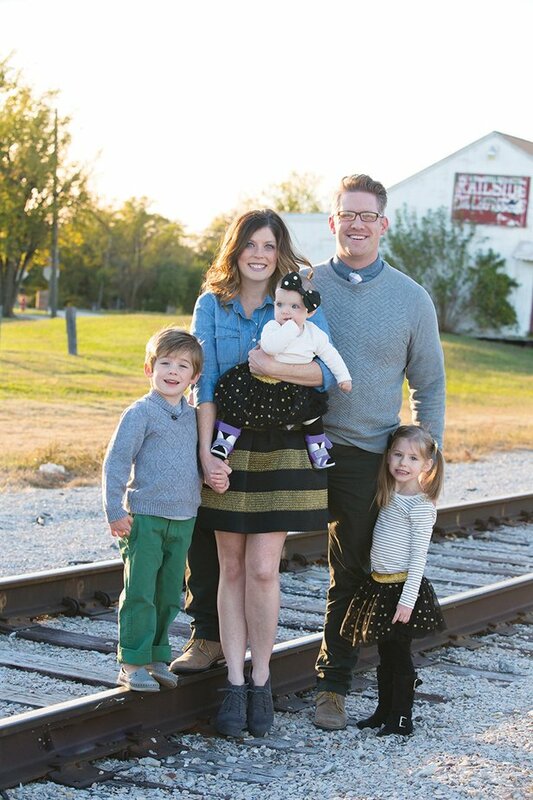 We hope that her life will say “Poppy Cox!” to all of the limitations that her diagnosis put on her. We are going to project that on to her through her name. As far as lows, we have a handful of medical risks that will always be hanging over our heads: hydrocephalus, kidney issues, scoliosis, etc. As a parent, it’s pretty heavy to constantly be watching for those. 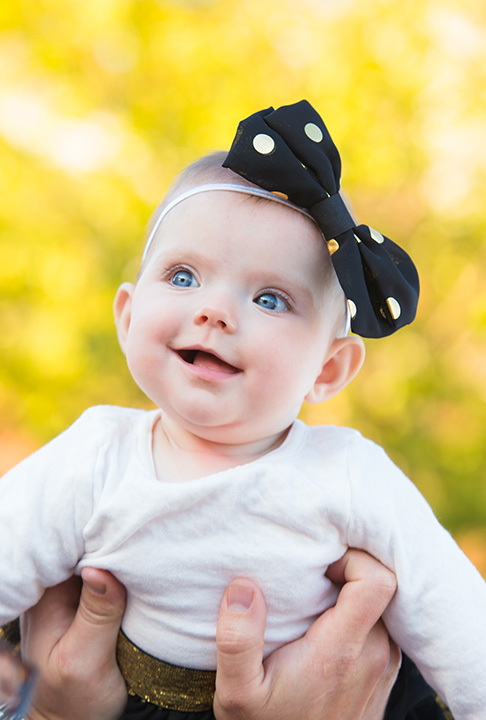 When she cries, we don’t know if it’s because she’s just a baby and that’s what babies do, or if it’s fluid building up in her brain that will require a shunt. It’s exhausting to constantly have in our minds. We have had a few bad doctor’s appointments where the news wasn’t what we wanted to hear... it’s devastating to have this tiny baby that you love so much and know that she is going to have so much to overcome. It’s been hard to absorb the ways that our lives will be different forever. We’re still new to this new world: only a little over a year in. Some days the sting is a little more raw than others. Seeing babies that were born around the same time as Poppy starting to take their first steps is bittersweet. 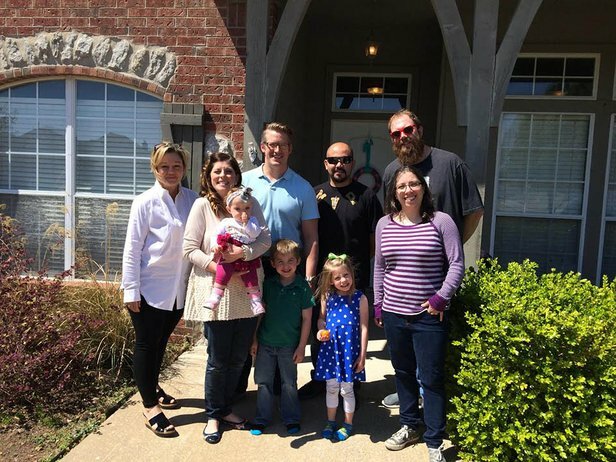 The Cox family with the OETA crew. As Poppy, Harper and Gavin continue to grow and develop, how do you see public television's role in their lives adapting to provide new, relevant lessons and insights? PBS has already helped provide our friends with tools to understand more about Poppy. For Christmas this year we gave our friends’ kids the book of the Daniel Tiger episode that talks about a character with disabilities and why she has a braces, it was such a great tool to help our friends’ kids know to ask us questions and feel open to learning about our daughter. Hopefully, it opens their eyes at an early age to respecting and caring for others. We are PBS people for life, so I have a feeling whatever shows are on and age appropriate for our kids, we will watch.